Editor’s note: This is a repost from the ESA Rosetta blog; the original was published here on 4 November 2014. 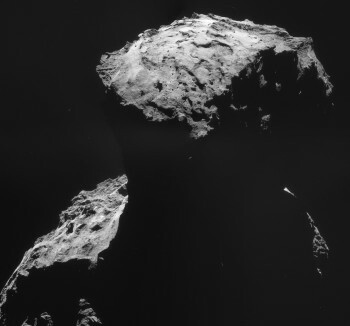 As of today, we will be sharing all Rosetta NAVCAM images under a Creative Commons licence. In particular, we will be releasing them under the so-called “attribution share-alike” version of the licence, ported for use by intergovernmental organisations, referred to in short as CC BY-SA 3.0 IGO. We’ll explain the background and how this works in more detail below, but essentially it allows you to share them with whoever you like, to publish them on your blog or elsewhere, to adapt or remix them (e.g. to add in the Eiffel Tower for size comparison purposes), or to post them on Wikipedia. You can even use them for commercial purposes under certain conditions. You can do all of this without our additional permission, as long that you clearly credit ESA as the source. You also have to mention and provide a direct link to the licence, and if any changes are made to the images, your remix or adaptation must be published under the same licence terms (CC BY-SA 3.0 IGO). You must also not give any suggestion that ESA necessarily endorses the modifications that you have made. That’s it (and don’t forget to make the last part a link!). When space is really tight, in a tweet for example, it is sufficient if the original source (e.g.. your blog post containing the image) carries this credit line. For those who never heard of Creative Commons licences and how they work, let us get into a bit more detail now. Creative Commons (CC) is a non-profit organisation that provides a free-to-use, modular suite of licences designed for the digital age. It was founded in 2001 by Lawrence Lessig, today a Professor of Law and Leadership at Harvard University, with the aim of making the exchange and usage of cultural goods compatible with a rapidly-developing digital cultural and economic world. The CC licence suite encompasses a whole range of options designed to encourage the sharing of material, albeit with differing levels of restriction. For example, CC BY is the most liberal licence and allows sharing, remixing, and tweaking of works, even commercially, just as long as credit to the source is given. At the other extreme, the most restrictive licence is CC BY-NC-ND, which allows them to be downloaded and shared as is, with credit given, but no commercial uses and no derivative products. CC also provides tools for placing works fully in the public domain. One of the most remarkable aspects of the CC licence suite is its comprehensibility for laypeople, with a ‘human readable’ version of each licence designed to make them easily understood and usable without having to have a background in copyright law. While the CC licence suite has been available for quite some time, it became apparent that some of the legal backing was not entirely suitable for Inter-Governmental Organisations (IGO’s) that operate across many legal jurisdictions. Thus, in December 2013, a working group of IGO’s, in close collaboration with CC, brought another so-called ‘ported’ Creative Commons licence suite to life. The effort was initiated and led by WIPO, the United Nations World Intellectual Property Organisation, and the working group includes not only ESA, but also other IGO’s such as CERN, UNESCO, the OECD, and the World Bank. There are no differences between the standard CC licences and those of the IGO-ported equivalents in the ways that content is made available, only in the mediation and arbitration processes that are applied if the licence is violated. More information is available on the CC wiki. With the licence suite now in force, it then falls to each IGO to implement it according to the materials they are making available and their specific needs. For example, CERN has started making images and some plots and graphs resulting from some of the Large Hadron Collider experiments available under CC licences. Within ESA, we have now started implementation and intend to gradually introduce CC licencing for still and moving images to which ESA holds the full rights. As this is true for Rosetta’s NAVCAM images, these are among the first ESA works to be released this way. In particular, we have chosen to go with the CC BY-SA 3.0 IGO licence, which allows sharing, tweaking, and remixing, even commercially, as long as credit is given as described above, and as long as any derivative works are also similarly licenced. We are also applying the licence to all NAVCAM images released to date, although it may take us a while to go back and change the credit lines for all of those images online. In many ways, CC is similar to open source software licencing and is aimed at encouraging broad sharing of materials, whether original or derived from the original. Importantly, it is the licence used by Wikipedia and similar projects, important vectors for getting our images and other products into as many hands as possible. Ultimately, we hope that our partners in scientific organisations and institutions throughout Europe and the world that also hold some of the rights to images and data taken by instruments paid for with national funding and flying on ESA spacecraft will also join us in releasing works this way: we are starting discussions on that now. So why is it important for public organisations to support Creative Commons licencing? On one hand, the taxpayer funds the works created by those organisations and it seems perfectly reasonable that they be made available to the public in a timely, orderly fashion, while also recognising the rights of others involved in their creation. And, let’s be frank: we are, of course, also hoping for a wider dissemination of our content and a wider understanding of the amazing things we do at the European Space Agency. Written by Marco Trovatello, Strategy Advisor and Cross-Media Coordinator for ESA’s Communication Department and Mark McCaughrean, Senior Scientific Advisor for ESA’s Science and Robotic Exploration Directorate.